Sharp entered the digital signage field in 2005. At that time, most digital signage adopted plasma displays, while Sharp incorporated its LCDs, reflecting the company’s legacy of leadership in LCD technology dating back to the 1973 release of the world’s first LCD product—a calculator. 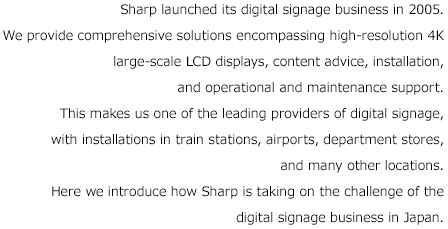 Along with LCD sales, Sharp’s entry into the digital signage business has brought continued development of a range of solutions in areas related to conveying information, including content transmission, networks, and support (and maintenance). These developments have made it possible for both public and private users to employ digital signage to deliver a larger amount of more diverse information and advertising. 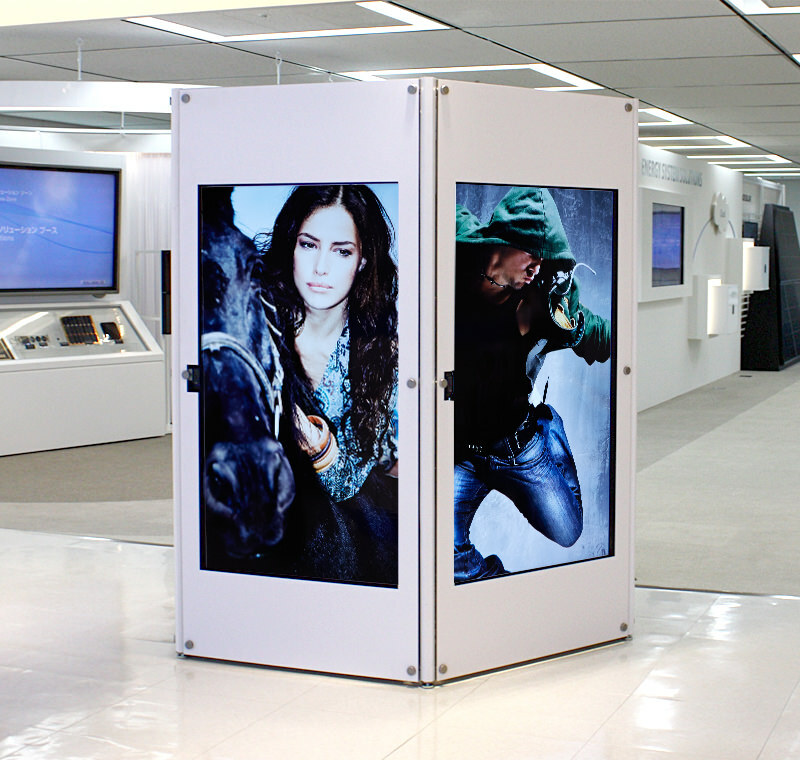 In Japan, Sharp has become a one-stop shop for digital signage. We offer systems that provide multi-lingual information for tourists and visitors of many different nationalities, and hardware solutions such as multi-display set-ups that cover entire walls to maximize space efficiency. On the software side, we build centrally controlled content-provision systems that adapt to the increasing interactivity of digital signage information, and we provide consulting on content planning and creation. Last but not least, we install digital signage and take care of its maintenance. 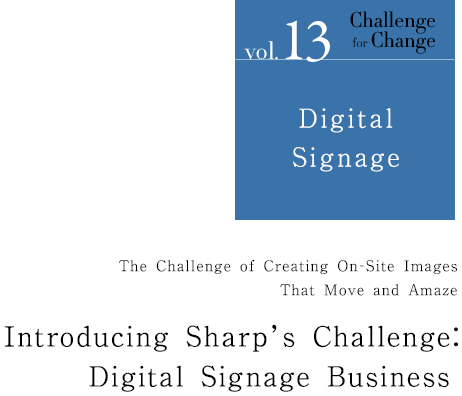 The history of Sharp’s digital signage business has been one of taking on the challenge of building such a comprehensive business model. Because public spaces and stores have limited installation space, LCD displays are often hung from the ceiling or attached to pillars (using the housing of the pillar) in order to make it blend in with its surroundings. The displays must therefore be thin and light, as well as robust enough to withstand operation in a range of environments. With digital signage showing increasingly larger volumes of information, the market is demanding ever-larger and more high-resolution displays. Sharp has thus had to develop digital signage displays and systems that satisfy a range of conditions related to size, function, and performance. Highly detailed information such as maps must be displayed crisply and clearly, even when viewed up close. This is where 4K*1 displays have met a need. Another crucial factor has been the design of an intuitive interface with highly responsive touch sensors on touch-panels, so that users can easily navigate content themselves. With increasing market demand for digital signage come many new challenges. 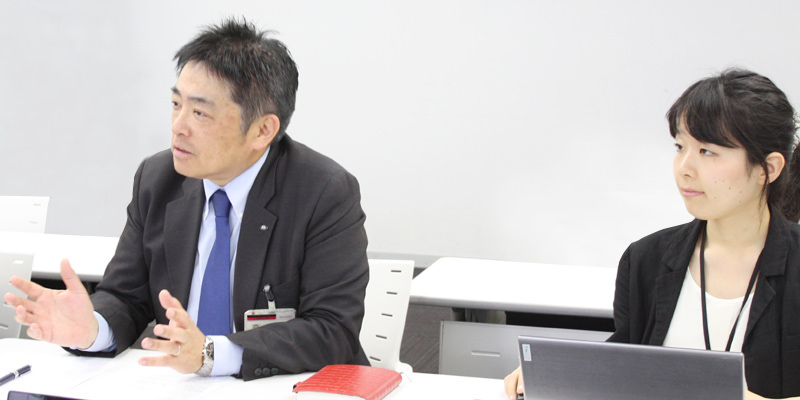 In order to overcome these challenges, Sharp formed a cross-organizational team comprising members of sales, display development, software development, and service departments. 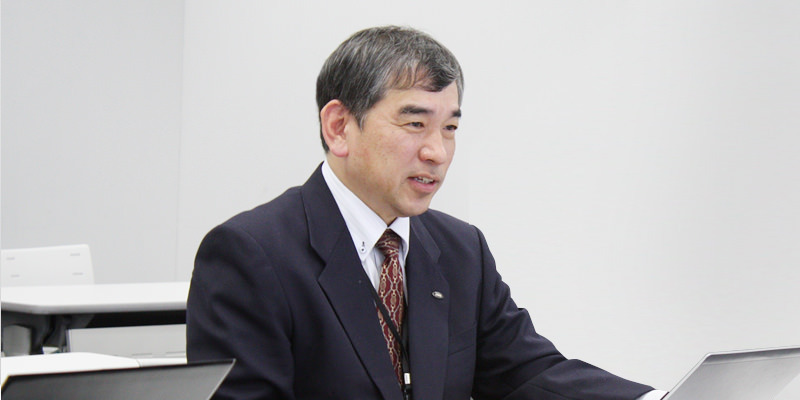 This team has continually sought ways to develop new technologies and meet customer needs. *1 4K: 3,840 x 2,160 pixels; four times full-HD. The digital signage environment has changed dramatically over the past 10 years. No longer exclusively in the realm of public facilities and traffic and transportation bodies, the use of digital signage has expanded into the retail industry—for both individual stores and nationwide chains—and into office settings. In response to these market needs, Sharp had to further advance its digital signage with a proprietary content delivery system it dubbed “Sharp Digital Signage Software” (named “e-Signage” in Japan). Sharp Digital Signage Software is for displaying and delivering still and moving images to displays; it also supports remote control via a network. Ten years in the making, this system has been continually modified to the point that anyone can use it to display information easily, accurately, and safely. Our goal in the research and development of Sharp Digital Signage Software was to make it possible for anyone, even people with little knowledge of computers, to learn it in 30 minutes. Sharp Digital Signage Software allows users to easily show multi-display content connected over multiple LCDs. Its basic functions include power supply management and remote monitoring of the state of a display’s operation. We have also developed various software adaptable to various customers, no matter what the size or nature of their business. For small store owners, a standalone version allowing USB media plugin to a monitor to display content is developed. For larger businesses, we provide a pro web server version that allows content distribution up to 1,000 locations via network. In addition, Sharp Business Solutions Corporation*2 offers a range of comprehensive services in Japan, such as Cloud Server, which eliminates the need for customers to spend time and money owning and running their own servers. 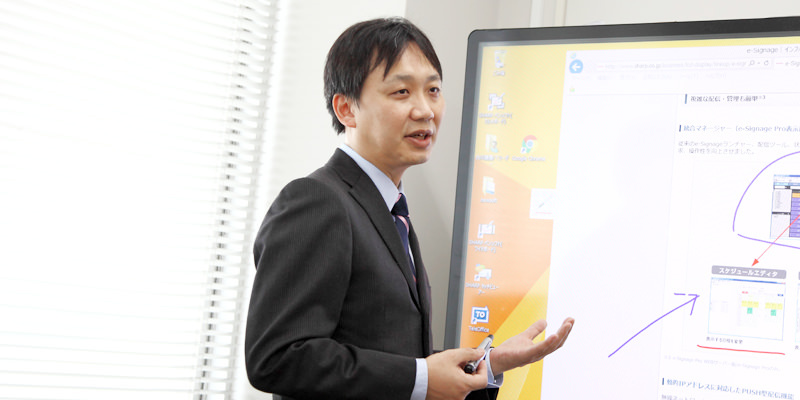 Sharp also offers iSignWeb in Japan, a content-creation support service that allows customers to display information without having to have a computer connected to the display. This web-based service allows users to, for example, use highly expressive fonts for text information and edit their own still images into moving images. It features over 1,000 templates. At hands-on digital signage seminars for purchasers of Sharp products, we walk participants through iSignWeb so they can get ideas on the type of content to use and how to manage their digital signage. Besides the obvious hardware advances, the continuous development of software that we have mentioned here has been crucial in allowing us to provide total digital signage solutions, whether customers are looking to manage small-scale content or large-scale information streaming. *2 Sharp Business Solutions Corporation: A Sharp affiliate in Japan. Comprehensive solution and support services include the sale of hardware such as system equipment, commercial displays, and document products, as well as consulting and system planning, development, and creation. 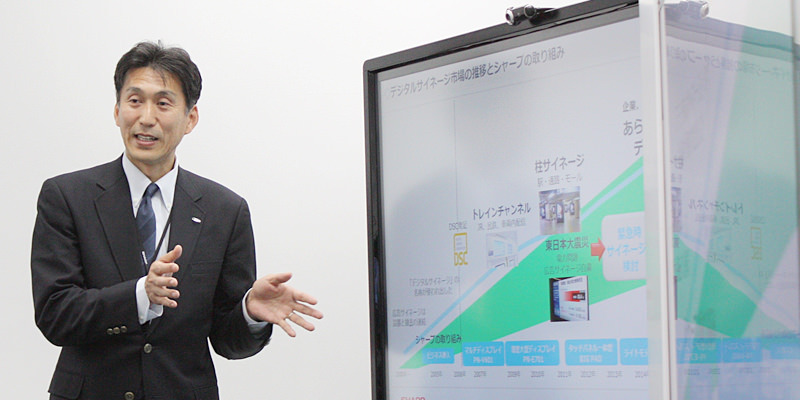 Sharp’s efforts in developing total hardware and software solutions for digital signage have resulted in large-scale installations throughout Japan. One of these is in JR Shinjuku Station in Tokyo. JR Shinjuku Station is one of the world’s busiest train stations, with users including many visitors from overseas. The station is so large that even locals can get lost. There was clearly a need here for effective digital signage maps. Sharp was proposed a plan to install a large-scale signage system in the West Gate Plaza of Shinjuku Station. Many station users pass through this section of the station. We felt Sharp’s signage can contribute to reduce the number of people who get lost going through there. Following numerous meetings with Sharp’s display and system personnel, Sharp’s sales representative eventually presented JR with a signage proposal. This proposal promised beautiful display images along with the functionality, convenience, and operability that would allow JR to provide a practical solution for tourists and all other station users. The center of the digital signage solution is a video wall comprising 12 displays of 60V inches, for a massive screen equivalent of 227 inches. On each side of this is a 32V-inch 4K touch-panel for easy searching of map information, and a 70V-inch 4K display showing enlarged images of the maps. These and other displays make up this integrated system. With English, Chinese, and Korean selectable at the touch of a button, the system responds to the needs of the rapidly growing number of foreign tourists who are flocking to Japan. The 227-inch-equivalent video wall in the center is the first*3 such large screen to be used as an information-provision screen in a public space in Japan. It shows only public messages, such as government announcements and transportation information. In emergency situations, half of the screen (six displays) shows NHK TV news and the other half shows emergency notifications. JR was impressed with this innovative Sharp digital signage proposal, and in April 2015 the system was installed. It has since been a welcome guide to the many commuters and foreign tourists who pass through JR Shinjuku Station. Let’s look at a digital signage installation in the free corridor (“Jiyu-Tsuro”) of JR Shinagawa Station in Tokyo. Along the free corridor —which runs from the Central Gate to the Shinkansen boarding area and to the Konan Exit—are 44 70V-inch LCDs on separate display. These treat people passing by to advertising and information in a new and interesting way. The free corridor is extremely crowded during the morning and evening, with people commuting to and from work. When people stop to look at individual LCD displays, they block foot traffic. To get people to notice advertising, the display has to be large. As well, displays have to be thin and light, or else their weight will cause them to fall. For the JR Shinagawa Station installation, Sharp looked to its deep product lineup and proposed the large, thin 70V-inch PN-R703 display. This energy-efficient model helps customers managing multiple signage systems to save electricity. Having 44 LCDs displaying images in a line all along the corridor is a sight to behold. However, every single display has to be in sync, and fine adjustments must be made so that images on all of the displays appear the same even when ambient light and other factors change. Coordination with previously installed systems is also important. Here, too, the know-how that Sharp has garnered through its many previous installations proved valuable. Through exhaustive testing and adjustments of variables such as display brightness and inter-display synchronicity, we were able to achieve a system that worked in smooth unison. Through its digital signage, Sharp has been striving to “change the city scenery.” By visiting the actual site and analyzing the paths of foot traffic, we share the vision with our customer how the site would look after the installation. This provides the basis for deciding on an outline for elements such as the display models and the content-delivery system. The displayed content would make the city more convenient by giving useful information to people who pass by. Furthermore, by matching space design and delivered content, we sought to improve the atmosphere of the city and thus contribute to raising the value of the region. We believe that advances in digital signage will dramatically change city scenery. Sharp’s many future objectives include demo-testing wraparound LCD display and creating 8K*4 images by connecting 16 full-HD displays to create a multi-screen display with powerful, life-like action. These and other efforts will allow us to realize the power of digital signage to create public-space images that move and amaze. *4 8K: 7,680 × 4,320 pixels; eight times the resolution of full-HD.